Great lighting is all about the modifiers. Whether it is the clouds that filter harsh sunlight or the light shaping tools that attach to the front of your strobes – the way you control the light can have subtle (or extreme) differences on your subject. I photographed three models using all the same equipment – changing only the light modifier attached to the front of my Elinchrom 300RX Monolight. 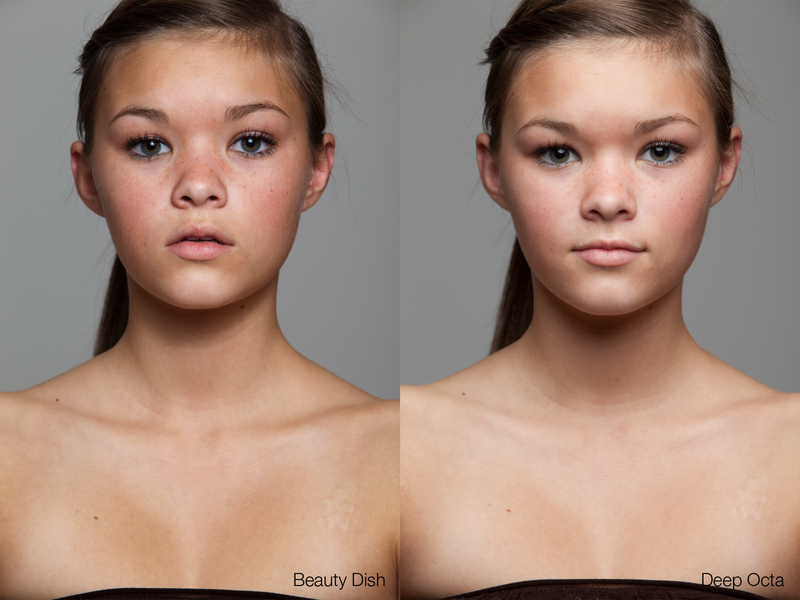 The Beauty Dish is a staple, and a favorite, for many photographers, especially those specializing in commercial beauty shots. 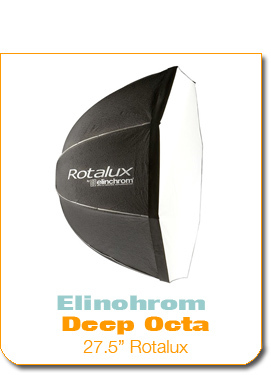 The Elinchrom Deep Octa is often warmly compared to the Beauty Dish for having a similar light quality, yet boasting the ease and convenience of being both lighter and easier to manage on-set as well as more portable (since it folds up nicely into a bag) – not to mention costing a little bit less money. So which is better? Looking around the internet I couldn’t find a side-by-side comparison and we all know if you want something done then… well… lucky for me the amazingly helpful staff at B&H Photo Video agreed to let me test drive the two light modifiers so I could make just such a judgment call, for you, my loyal blog readers. One thing to keep in mind is that all of these images are directly out of the camera, absolutely no post-processing work has been done to any of them. Since the Beauty Dish puts out a bit more light the power was adjusted up slightly for the Deep Dish shots, that is the only difference. This was the first test and as you can see the difference is distinct, yet subtle. The Beauty Dish (left) seems to flatten Brynlee’s features just a bit while the Deep Dish Octa (right) carves out the structure in her cheek bones and eyes a bit more. Keep in mind that Brynlee has a very unique face structure (which I’m semi-in-love with) and while your preference on lighting may vary I very much prefer the image on the right. She also has an amazingly unique face with perfectly rounded features. You can see how the beauty dish seems to make her face glow from within while the Deep Octa seems a little too specular. Notice too the softness of the shadow under her chin along with more shadows carving through her collar bone and upper chest. However, the Deep Octa does seem to add a softer highlight on the tip of her nose along with brighter lips. Overall my preference is for the image on the left. 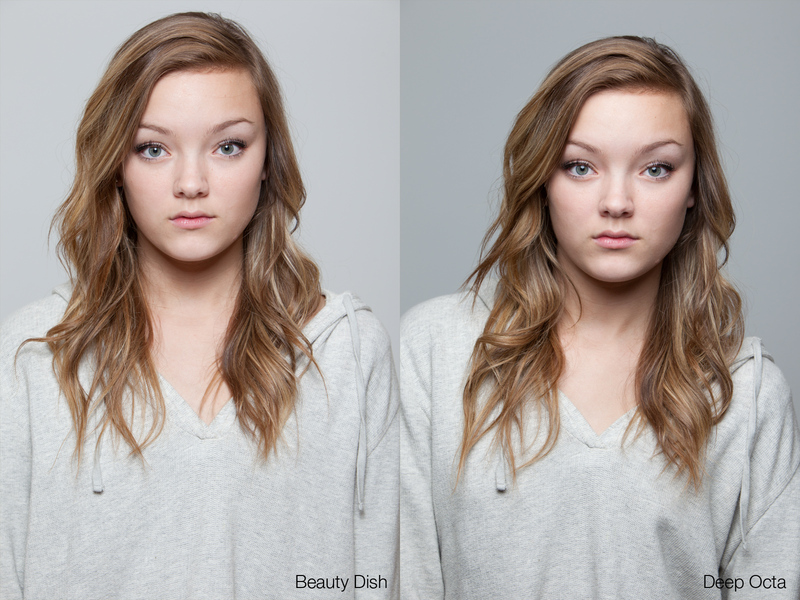 Jillian has a more angular facial structure which the Beauty Dish compliments so perfectly. Notice how the image on the left simply seems to have more dimension on almost every feature. 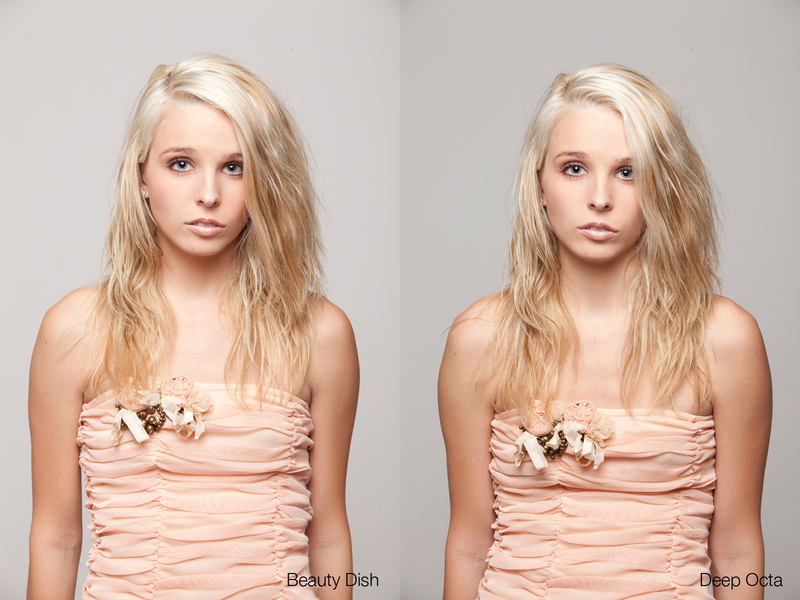 The Beauty Dish just seems to carve the light around her angles making for amazing shadows and highlights. Again, I prefer the left image, by far. I used both of these modifiers extensively beyond these three tests to help round out my thoughts and I’ll be honest at first I thought both were quite interchangeable. Initially I definitely had a preference for the Deep Octa mainly because it was a bit easier to take on and off, all you had to do was twist it off of the strobe. The beauty dish wasn’t much more difficult but the weight made using it on a boom-stand a bit cumbersome and I always seemed to forget to take off that little reflector from the front before un-twisting the dish. It was only after “getting to know” them a bit better that I started to discover the subtle differences – differences that are difficult explain without sounding like a nut-job – but overall I found myself being drawn to the quality of light produced by the Beauty Dish for probably 3 out of 5 set-ups. If I had to choose one then it’d have to be the Beauty Dish since I can see myself wanting to use it more often, however, both of the modifiers get a ringing endorsement from me – especially since the Deep Octa happens to be a bit more convenient and a bit better under certain circumstances, such as photographing unique faces like the amazing Brynlee! If you don’t already have one of these I’d definitely recommend saving up some pennies and picking one up! My favorite modifier to use is the dish and I agree with your thoughts on which photos is preferable. I would love to see a comparison on a guy however since I bet the octa would create harsher shadows and stronger lines on him. A very interesting comparison, though I have to say from a personal point of view, even though the Beauty dish does flatten Brynlee’s features a little, I don’t think it spoils the image at all and I love how it sharpens the highlight in her eyes, making them seem more intense. The Deep Octa does interest me. As of late, I’ve gone back to the “old school” of lighting with umbrellas, especially since I’ve found an OLD Bowens that is 30″ open and about 17″ deep, creating a really beautiful and dimensional quality of light. 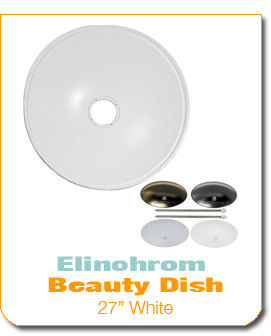 I’ve got probably the second largest collection of Beauty Dishes… So I don’t needs nemore. Wow, perfect timing on this post… I was just carving out a few bucks in the budget this month for a new modifier purchase and had been leaning heavily towards the dish – I’m now 100% convinced after seeing your photos that I’ve gotta get a beauty dish ASAP. Thanks, as always, for your open critiques and examples! I am also trying to make a decision about which one of them to get. I’ve been reading some reviews of the octa and it seems you can attach a deflector to it (i suppose it’s the same deflectors the dish uses). Is there any chance you can comment on the difference in result with a deflector on and/or the diffusion panel off? I haven’t used a deflector on the Octa, but I imagine the results would be very similar to a Parabolic umbrella. As far as shooting without the diffuser I did try that a few times, it gives more of a directional spot-light feel. Just stumbled across your site searching for deep octa reviews. Very nice – bookmarked! Was this back to back done with both interior baffles? Reason I ask is that I’ve read/heard photographers shooting the deep octa with the slide in deflector set (white, silver, trans, gold) and only the interior baffle used. This is supposed to more closely mimic the beauty dish look as you mask the source with the deflector (as a BD does) and leave a specular “ring” outside the diffused smaller source. I know you can’t test everything against everything and no-one expects that – just wanted to pass on what I’d heard and indeed will be trying in the near future. I did shoot the deep dish without the interior baffle in my experimentation but for this particular comparison I used both light modifiers fully assembled. When removing the interior baffle I tended to get more of a spot light effect rather than a beauty dish effect. These tests look manipulated. Since both the beauty dish and the softbox are same diameter of 27 inches, why are the reflections in the models eyes not the same size??? Well apparently the placement distances of the lights are not kept at a constant distance. Now the first test is more of a closer up head n shoulder shot, so the beauty dish would overexpose on the face. And the last shot is of full upper body shot, so the diffused light is too underexposed at longer ranges. But the middle shots, how can it be possible that the softbox is brighter unless exposures are different or pp’d? Interesting theories… I was going to review your review of my review but then I got bored. Did you use both diffusers on the Deep Octa for these shots? Sorry just seen last comment – thanks anyway…..
Would be interesting to see what the Octa performs like without those diffuser panels with a reflector dish that is not translucent…..
Hey – was wondering if there was a “single” solution – head, , 1/2, 3/4 and Full length standing models using the 27″ Beauty dish?? Would a 39″ Deep better meet these needs. Would you recommend using maybe 2 BD’s over and under for the full length shots or maybe the 27″ BD and a (27″ or 39″) Deep octa over and under for full length shots…? Frankly I’m not sure, I didn’t really try what your suggestion… though I’m guessing the beauty dish wouldn’t work great for over/under lighting. Was wondering what might work best…? Okay, now I have bookmarked you. There is indeed a lot to learn from you. At a first glance I preferred the Dish over the Octa, but maybe it’s not that easy. Brynlee’s hair (Gosh, what a beautiful model…) has got more depth with the Octa and I kinda like the harsher shadows. I also prefer the softer light that the Octa draws on Demi’s face, though it’s a pity that it makes her eyes look very dull. However, the shot of Jillian is indeed more interesting with the light of the Dish. Just going by the sample pictures I would probably spend my money on the Octa, but I suppose you need both and a lot more shots before to develop a clear preference. Anyway, thanks a lot for sharing! Andreas – you make very good points, I came to very similar conclusions! 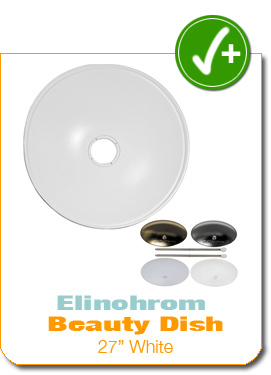 I picked up the Elinchrom 27″ SIlver. Also has more punch/contrast than the white BD. 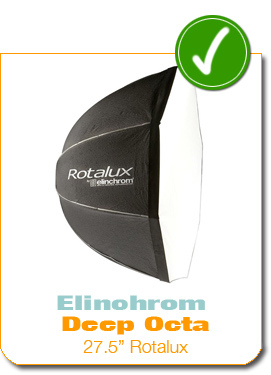 I use it in combination with a Creative Light1x4 strip light softbox and added 2 RX600s. Really like the look. Plenty of light for full standing models, no need for another light (in the above mentioned up/down config question). The strip light uses the CL SoftGrid. Just love it. Hey Jake, nice comparison of the two modifiers. Just wanted to ask if you tried removing the front diffuser from the Deep Octa, I’ve found it gives a much nicer quality of light. Thanks for showing two examples between deep octa & beauty dish, i think deep oct is much better looking between the person and the background, try convert into b&w you will get pretty awesome result.